The second day was dedicated to reflections on Public Participation GIS or Participatory GIS. The day was organised by Rina Ghose and Bandana Karr with some comments from Renee Sieber and me at some stage. It turned out to be an excellent symposium. The following are my notes from the different talks during the day. Rachelle Hole, Associate Professor – University of British Columbia Okanagan: Plain Language Mapping: Rethinking the Participatory Geoweb to Include Users with Intellectual Disabilities. Jon talked about the background of participatory mapping – starting from development context. Within the geoweb, it is easy to forget what the aim of the system. He describes people who are with intellectual disabilities, and because work is so meaningful in society, they wanted to enable such people to share experience about employment. They wanted to especially focus on positive experiences that can be shared. They started created an employment mapping tool using the GeoWeb, to understand how to overcome barrier for employment. They are working with different stakeholders – and the map uses classification with the job type and the process stage. They see it as opportunity for people to share details and create a network of support. They used co-design which included people with intellectual disabilities. There are issues in the design – dealing with ‘contribution bottleneck’ and change the interface of the wizard that enter information to the system so that is not text driven. The assumption of tech poverty for people with intellectual disabilities is wrong – but they use it differently to other users, so need to recognise what they use (e.g. smartphones) and adjust to them. Hammering spatial literacy – do we need to solve everything with maps? Can we solve it without it? it is a thing that we need to ask. Greg Brown – University of Queensland – The Vexing Problem of Spatial Aggregation in PPGIS/PGIS/VGI for Sustainable Land Use. The problem of spatial aggregation and crowdsourcing. Over 25 studies from different planning contexts – described at www.landscapevalues.org . Within participatory mapping, terminology is maddening: is it PPGIS, PGIS or VGI? In reviewing the area, he suggests PPGIS (west), PGIS (development), VGI (technology). In PPGIS, which Greg focused on, it is dominated by rational, synoptic planning – but there is an alternative, radical planning that make it all contextualised and situated. Participatory mapping bring three aspects about places: place ecology, place phenomenology (experience) and place management. The breakthrough in PPGIS/PGIS was to move from GIS that focuses on the physical world, to one that is about values and the experiences that people have. We need to get beyond the rhetoric and in participatory mapping we need to improve the substantive quality of decision-making. Is public participation is the wisdom of the crowds or the tyranny of the masses? Crowdsourcing can get better decision-making through Surowiecki type analysis on ‘wisdom of crowd’. 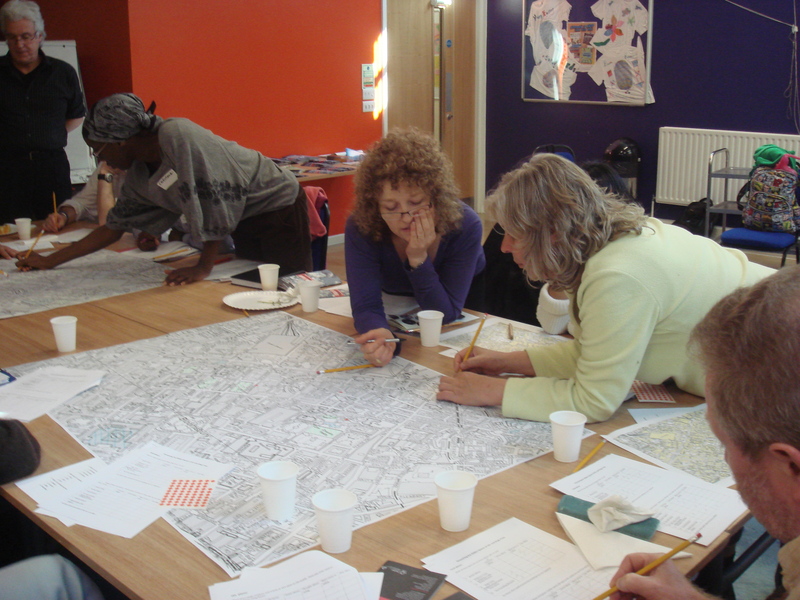 In many participatory mapping we haven’t made difference – and there are multiple reasons for it, from concern about the role of expert and the public to regulatory reasons. When you aggregate the data, you have a challenge of how to count the voices. PPGIS/PGIS/VGI have not substantively influenced land use decisions – technology is search of actual impact. The issue is political – how to weight and agree on weighting etc. Bridging the spatial and the political is the challenge. Patrick Oberle – Syracuse University – Web-Mapping Practices and Challenges in Syracuse, NY. Covering experience in Syracuse Community Geography programme. Syracuse is very poor, and community-based organisations (CBOs) have an important role in the city with lots of CBOs. The main points to explore are neogeography and alow citizen ‘scientists’, democratisation of knowledge production and considering local information. He run a series of local workshops on how to use Google Maps Engine to CBOs and to what degree they support CBOs. He looked a the Syracuse Poster Project (public art with poems), and PEACE inc. which is community action agency, with ‘head start/early start programme for children, and other poverty-reduction programmes. They wanted a map to show where they presented their posters – they created an effective map with details that lead you to prints. It took them 7 months to create map. They had a sense of place that made it easy to adopt cartographic viewpoint – they had narrow goals. PEACE wanted to engage with population and had vague goals of managing their places. They had broad organisation mission and complex needs – which mean that the effort was not successful. They found it hard to dedicate staff to focus on the task. However, even for the poster project it was challenging to work through and deal with technology. Data is also not accessible – in contrast to NYC, Syracuse cannot afford to prepare data for sharing and provide open data. We need to engage the producers of the technologies, need experimentation with technology and processes, and help people to understand the paradigm of data-driven perspective. It is not obvious to unfamiliar organisations and groups. Now that Google Map Engine is discontinued they need to figure out how to move it to a new ways of delivering, but they are capable of recruiting interns. Stephen R Appel – University of Wisconsin Milwaukee Department of Geography – Information Justice and Public Geospatial Data. The aim of his research was to understand the scope and purpose of access to data and in what way data is accessed. The run a survey of municipalities, counties, land information association and then interviews with participants and web site survey. Referred to GIS & Society literature. The aspects of power in access the data and legal issue with data. He found variety of practices among counties in terms of opening and licensing the data. Most counties have web services, but it is variable. Conclusions are – extreme variation in policy, availability, and activities. Most allow academic use, and academic users need to get ready to use web services. The second session 2253 Looking Backwards and Forwards in Participatory GIS: Session II started with a short discussion, due to gap in the schedule. Some discussion points started to emerge: how data should be integrated with other systems? how to be inclusive? but also how to make the data active and relevant to decisions and results? How to give voices to people who are marginalised – all participatory process have double objectives: empowerment but also want content that is actionable. Sometime they contradict each other. A very small group of people are participating . Though need to accept that all democratic processes are messy. Yoshiki Wakabayashi – Tokyo Metropolitan University & Mikoto Kukimoto – Oita University – Possibilities and Limitations of Childcare Support Maps from the Viewpoint of Participatory GIS. The GeoWeb in Japan became part of the technologies used by government. The relationship between the voluntary sector and government is something need to be explored. Increase maps of childcare support, with about 10% of the total of online maps. There are more working mothers and childcare is an issue that concerns local government. He analysed 360 maps of childcare support in Tokyo Metropolitan Area, defining 3 levels – Level 1 – static, 2 some interaction, 3 – adding data (participatory), using the Sieber and Johnson framework. There are only few examples of level 3. More than half of the maps are interactive, but only few are truly participative. You also see the use of Google Maps as basemap and that increase usability. There are also maps that were made by voluntary group – made by mothers in the Meguro Ward. The group funded by local government, and core group of 5 mothers collected the data. The technical skills include Google Docs, Yahoo! mailing lists. Maps were printed and delivered in community meetings. They also include comments on the map (e.g. ‘cannot enter with buggy’ but also ‘delicious bagel’). The voluntary group cross jurisdiction issues. Maps were also shared on facebook – the purpose of the maps is to make link between community members, exchange childcare information and facilitate face to face communication – so they didn’t want an online map. The conclusion is that the local government maps while web-based, are not encouraging participation. Renee Sieber – McGill University. Frictionless Civic Participation and the Geospatial Web. The increasing view of participation as frictionless. ‘Participation is very easy now – you just harvest sentiment from twitter or other social media’. She wonder if participation is effortless and in the background – just getting it from extracting what people say on media. In Smart Cities there is a view that the city need to be frictionless. Observations: 1. via frictionlessness participation is increasingly rooted in technocratic governance. The technocracy is setting the problem and the solution, but it’s not to be discussed but to be communicated. 2. Participation is not a transaction. Making public participation as a transaction and not engaging democratically. Relationship between government and citizen as transaction and consumptive experience. 3. Frictionless participation is increasingly unitary & lacks resilience – individuals interacting separately and therefore can’t build movement. 4. Geo-carpetbaggers who can ‘deliver participation’ much faster – computer scientists offer it in a faster way, what is the point in deep engagement if it is possible to create an app in 2 hours. 5. Participation is not 140 characters – it’s not about harvesting stuff for meaning. There is algorithmic regulation to set why you are engaging and who you are. Conclude: we make the assumption that the web/mobile is democratising – we problematise the government or the private sector, but citizens want convenience and we should challenge them too. Also public on the Internet can be trolls or game the system. Mike McCall – Universidad Nacional Autonoma De Mexico, with Jeroen Verplanke – ITC University of Twente and Claudia Uberhuaga – Technical University of Madrid – What does PGIS have to learn from VGI/Crowd Sourcing, so that we survive and prosper? PGIS and VGI have common purpose? there are changes in image of authority and offering alternative authority (UGC, citizen science, counter-maps, promoting feelings of Agency. Maybe we should think of VGI.2 – vulgar grounded intelligence. PGIS offer verification – trust, interaction, reputation & accountability. It’s physical, tactile, material, visual and sharing the process which is meaningful. Participation has to be slow and costly per unit of information – even volunteers need compensation. VGI provides speed, currency. Less manipulation – it is very cheap per quantitative unit of information. But the downside of VGI that it doesn’t give 2-way interaction and feedback, no rich data, no FPIC (Free & Prior Informed Consent), transparency and commercialisation. Both forms are open to ‘Elite Capture’. PGIS the question who control the framing or the inputs. The framing is easy to manipulate and take over. Very easily to control. VGI control the aggregation and the framing. The question is: can we speed up PGIS when we need it? That will mean the focus on the results. Most PGIS are short-term work done by NGOs or research organisations. It is one-off because of funding. Also need to think about the scale beyond parochial – broader dissemination in time, broader dissemination in place, share good practices fast. Scale can be in online participatory mapping and we want to make it more participatory – even hinder elite capture. Not to have naive belief in community solidarity or in crowd wisdom. Also where the trust come from -internal and external. Rina Ghose – University Of Wisconsin Milwaukee – Deconstructing Citizen Participation and Spatial Knowledge Production. Rina looks at places where people are marginalised along class and race – multiple marginalisation. Working since 1993 with community groups in inner city neighbourhood. Very racialised landscape. Strong digital and other divides, and geospatial divides. The context of PPGIS is that in many cities there is a mandate for community participation in the US, participation is not smooth due to neoliberalisation in different form. It leads to inequities and poverty. The collaborative governance model is about public private partnership that are shaped around restructuring the role of the state and reduction of funding to community organisation and social welfare. Service delivery is not done by the state. She use political economy analysis from Kevin Cox work – spaces of dependence where there are some spaces of engagement , with politics of turf. Rhetoric of citizen participation is done through performative acts – volunteerism, self help (right to the city – prove that you are good enough to deserve the rights). Many activists led organisations are being put out of action by removing the funding. In Milwaukee university there is a long tradition of supporting CBOs and can see the complex network. CBOs have challenges such as reduced funding, and they wanted to bring facts to demonstrate the needs are not being met. Role of activists are shifting, but they are asked for rationale for investment and demonstrate professionalism. There is on going data collection and using maps for traditional activities. Using paper maps overlays . Neoliberal rationalities are dictating the way CBOs operate and work. Maps were used to communicate, plan and create spatial strategies – e.g. mapping liquor stores, but also asset mapping to show potential for economic development and show successful project outcomes. Maps are ‘brag sheets’ – demonstrate fiscal outcomes or client demand, dealing with health issues. Neoliberal impacts: spatial knowledge production is shaped by rationalities as project goals. The organisations lack GIS abilities and it is crucial for them to get support from the university and other people who offer help. Politics shape use of data. Is there also neoliberalisation of PPGIS in terms of how it operates? This is an open question. Kumkum Bhattacharyya – Eastern Michigan University, Aditi Sarkar – Indian Statistical Institute – Land Use and Land Cover (LULC) Change Detection in the Ganga-Damodar Region – A Participatory GIS Perspective, which covered participation at government scale, in water and resources management. Pamela Jean Robinson – Ryerson University and Peter Johnson – Waterloo – Civic Hackthons: New Terrain for Citizen-Local Government Interaction? They been looking at civic hackathons – the empowerment of local communities and their meaning. civic Hackathons are linked to the concept of open data – they are time-limited event (weekend), mix of people – lots of people who can code, with open data and prizes and government host. People work to create the data into play. There is a difference between the civic hackathons and app competition is very different. Are they a form of procurement – are they getting a product outside the usual processes and did the events led to change in government activities? Secondly there is the issue of citizen engagement. In terms of backdoor procurement – is it getting technology for free? Are they get products without proper scrutiny? People have mixed view if open data will improve accountability and processes. Are people exploited and fairly compensating for software development effort? Are there obligations for government to treat people differently? Civic hacking is new form of civic engagement (Levitas 2013). They went to core values of public participation as defined (core values for the practice of public participation). In hackathon people decide and design how they want to participate and have the information. This is one-off event so how impactful it is. Early finding from researching with government that done hackathon. Actually, there are no products coming out of them and very little procurement happening because sustainability of app development is an issue. There is no concern within participants about virtual sweatshops, but there are concerns in the terms of employment of the municipal staff who spend big part of the weekend on this activity. In terms of engagement, the most important aspect is new space for interaction between municipal staff and community. Different kinds of sharing expertise. What do hackathons mean over time and they are developing hackathon assessment tools. How you have ethics form so it doesn’t kill the process. Nancy J. Obermeyer, PhD, GISP – Indiana State Univ – Preserving Small Town Cinemas through Crowdsourcing. Nancy talked about how using kickstarter to community asset. The town Batesville, IN is small – 6500 people, Germanic roots. Have industrial history – furniture, medical equipment etc. The Gibson Theatre was around from the 1920s, in small towns, the relationships are familial and know people personally. There was a kickstarter campaign to preserve the place, and they reached out to news stations and that helped them to raise the funding. One of the emerging question in the discussion is the degree of ‘crowdfunding’ community assets, and the abdication of local and national government from protecting and funding heritage – another form of neoliberalisation in which the communities are left to fend for themselves, and because of inequalities, it’s the people without major financial assets who are expected to volunteer their income to such services. Zachary A. Jones, MA, MS, PhD (ABD) – Eastern Michigan University Using Charrettes and other Pedagogical Tools to Develop Participatory Geospatial Technology Plans and Support Ecojustice Planning Decisions. Using technology in master planing and find a way to education and group pedagogy -and avoid reliance on mechanism and scientism. The knowledge base is usaully of experts, but local stakeholders have lots ofknowledge and there are people without voices – children, non-humans. Sophistication level necessary for GIS operation is high and only small group of experts can use it – surely not general population. A consortium of municipalities (SEMCOG) doesn’t have geospatial information and technology plan as part of their master plans. Growing reliance on GIS and geographic technologies in decision-making creased a deficit for local stakeholders. Would like to adopt PGIS to democratise geospatial information collection and use. Borrow tools for educators and planners -lesson plans (to deal with deficit thinking) and charrettes to encourage decision-making by community members, and expect that to be run by municipalities. Aim to run workshops that explore issues and technologies. Initial sessions explored expectation from PGIS and where it fails. That will be followed by the need to address concepts – master plans, feed of information act, privacy issues, Geographic Information Technologies plan. Antonello Romano – DISPOC, Università di Siena – Noise busters: noise detection and perception through citizen science approach and crowdsourced information. Exploring gamification of experience about noise in the city aim to increase user contribution. The idea is to put gamification to engage people in problem solving. The aim is to improve data collection – game your place. not to emphasise the competition but to have the playfulness. The objective is to encourage participation and collect data about loudness pollution – used NoiseTube to do data collection. The basic elements are to create the game board, game rule, finding a way to create a situation that everyone win. Game elements are trying to encourage participation and not about the observation itself. The first results – they had 123,500 measurement and 28h of data collection in a week. The geography of games covered the whole city centre. A closer look at the data show level of noise across the area. Highlighting the participatory layer: everyday life, participation, VGI, sociability, problem solving and discovering places. Finally we had a panel session 2553 Looking Backwards and Forwards in Participatory GIS: Session IV, including Bandana Kar (Chair), and Renee Sieber, Nancy J. Obermeyer, Melinda J. Laituri and myself as panellists. Renee started the discussion – PPGIS past, present and future, and using a definition which we had many discussion that complexify every aspect of it – is it about marginalised people or increase participation? Skills and abilities continue to be challenges for practitioners. You need to be system admin and developer to run system and maintain them. There is also a numbers game – how many people are involved? Also Social Darwinism – if you can’t deal with the system, it is your problem and we can’t help. PPGIS is seen as effeminate participation compared to proper masculinity in VGI and crowdsourcing. Losing sight of boundaries that matter – such as jurisdictions. Nancy Obermeyer, students understand that they need GIS knowledge and expertise. GIS is poorly integrated into the curricula of public administration. In public administration and participation – how we get more input from the people that will be effected by the actions that they are making. Melinda coming from the participatory GIS approach, thinking about fine scale data collection with TEK and indigenous groups – what people want to map and not, how to deal with ethics and what should be mapped. The relationships with the community are complex – what the impact to the people who change the community and long-term changes. To work with responding to disaster and deal with rapid response and activities like mapathons through Mapgive – learning from the success in Haiti response. We need to unpack that a bit more. We need to look linkage between participatory mapping and remote collaborative mapping. Making digitising fun because of the context and atmosphere. Thinking about VGI/PGIS – this is a different approach but need to explore opportunities. 1. start with a blank map or an image? 2. in experience with state department: academics are fish out of the water – what academics need to figure out with the practice? 3. digital divide – don’t assume access to technology and need to think about that 4. education 5. excitement about data collection – how do we analysed that? how that enrich our information base? My take own take away from the day where the following: First, in PPGIS there is always an element of ‘conforming (to) the opposition’ (Renee paper from 2001 is relevant here) – and this is how the external governance structure set the agenda of the processes. Secondly, we need to work beyond individualism & neoliberal framing of citizenship and development: this has clearly gone worse over the past 20 years, so in many ways it is not more difficult to do PPGIS. This also mean that we must position PPGIS within the wider context of technology and society (with issues such as 99% and inequality, prevailing cyberlibertarian modes of thinking in technology products that shape society etc.). We need a more nuanced concept of participation: work hard so all voices are heard – but allow people to ‘delegate’ and not actively participate. Some people will be happy just to attend meeting to check that views are like theirs, and other will happy to trust a friend. We should allow for that. The next thing is that because of Big Data, more attention to the end use of the data, ownership and credits are important signifiers of purpose and values. Finally, because of the way tech companies are hijacking social terms, we need to explicitly define empowerment, inclusion, marginalisation, participation and democratisation. Piotr Jankowsi mentions the power of numbers. We started doing PPGIS on the premise that the right of people to have a say on decisions that influence their life – that’s what PPGIS is about. We try to facilitate the ability to pass information to those in positions of power. Numbers do matter – between 5, 10 or 2000 people. Those who are in position of power tend to listen to bigger groups. When we facilitate public participation, we need to give an avenue for larger number – in order to make it effective. Cristina Capineri – noted the need to recognise changes and the way that we need to understand opinions and values which then opened the door for new ways and methodologies that are being used. when we are mapping we deal with problems and challenges in society and work at hyper local levels. Peter Johnson – increase focus on separation between science and decision-making, how does that fit into encouraging the public to carry out research and doing the work itself? The general view was that it is working side by side with science – not replacing. There is also funding and stopping funding to the bits of science that are inoffensive. However, I noted that there is a huge increase in people with higher education, and that does create an issue for decision makers, as the general population is more sophisticated and can use information. Greg Brown pointed that we must notice the mega-trend is that people are losing civic engagement, we have lost of connection to place and decline and knowledge and connection to place. PPGIS works again these trends. Bandana Kar – there is marginalisation within the PPGIS community, we should keep links. Though it might outlast GIScience. Piotr – part of the problem with civic engagement is lack of impact. People participate but see no outcomes and they don’t feel that they see the impact. Something need to be done with the results. Greg – need to see the process and the outcomes, and people need to see how the outcomes of the process are based on the consultation. Mike McCall – there is participation fatigue that growing, and we need to ask question about representativeness which can be manipulated by those involved. Who is selected (even deciding women participation) is important. Using individual maps is different from the community mapping. Can do snowball mapping where the size is growing with each maps. Another point is that starting with a blank map is that people mark their territory, and within it. Satellite or image can be used in suitable context when they are relevant – need to consider context. Finally, a question was raised to what extent questions are rising from the communities themselves?